Road Condition: 2WD dirt road that becomes paved. Parking: Seems to be plenty of parking available to accomodate crowds. Only several cars when we were there. Campsite Availability: Two well-established campsites on lake and one near first junction. 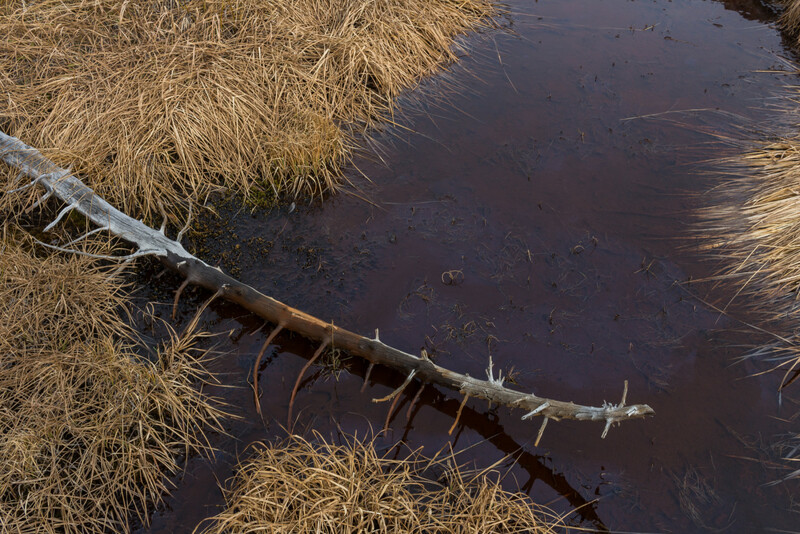 Water Sources: Creek is easily accessible for the majority of the trail. Snow: Some patches in the vicinity of the lake. Peaks were snow-capped. Weather: 40's to low 50's. Cloudy. Some flurries in the evening. Side Quests: Hike around Mirror Lake. Hike to Summit Lake (~2 miles). 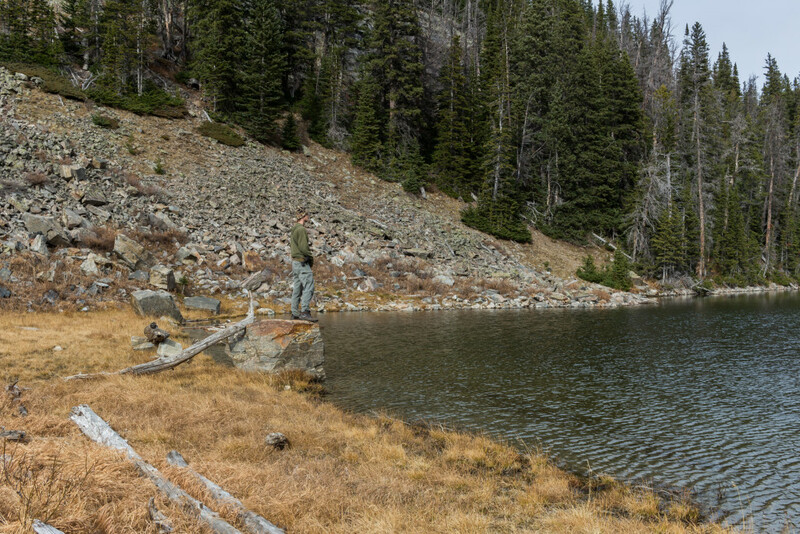 The Spanish Peaks house some of the most pristine mountain lakes around and if you’re willing to venture deep within the Lee Metcalf Wilderness, Mirror Lake is an excellent option for a first overnight in the area. Unlike many other “local” hotspots, the access point is reasonably close to Bozeman and the road is in great shape. 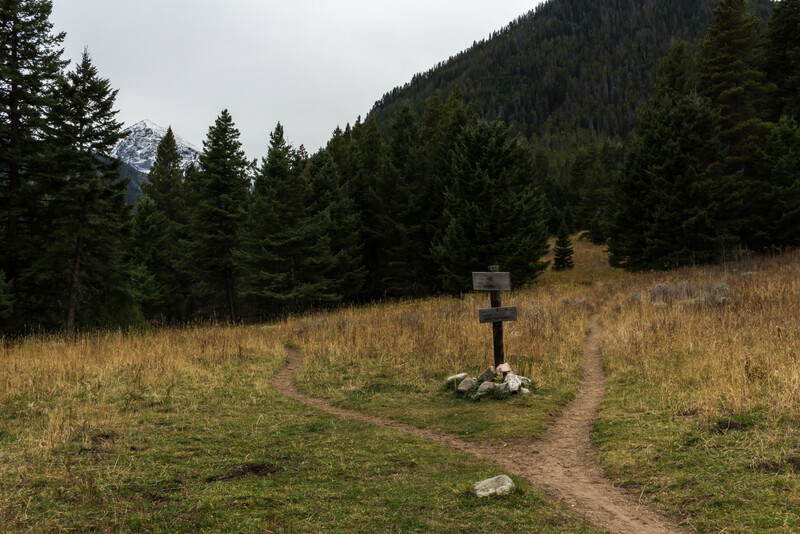 The trail itself, while not out of this world, has its moments; it snakes along with the South Fork Spanish Creek through a thick subalpine forest and is followed by a steep climb up to the lake for a grand total of 2400′ over 7.5 gut-wrenching miles. The grandeur of the lake makes it all worth it in the end though. 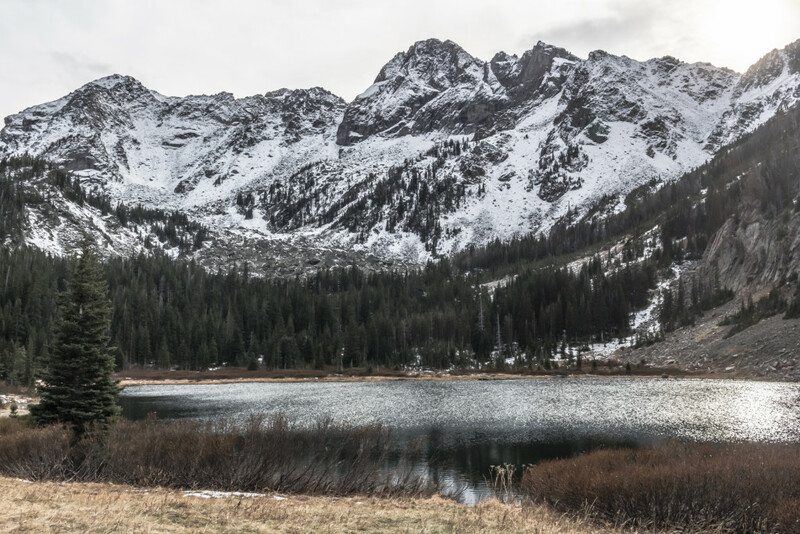 Sharp mountain ridges tightly cradle this beautiful subalpine lake which sits at 8400′ at the base of Blaze Mountain. 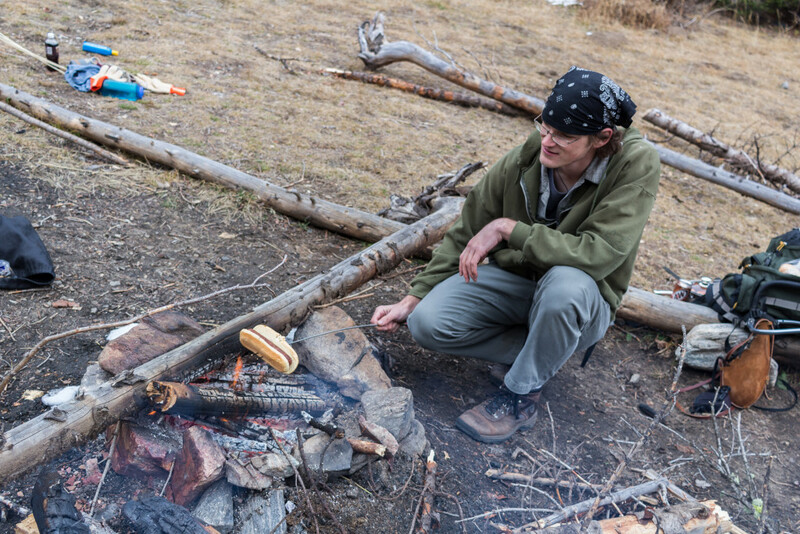 Plus there’s plenty of fire-restriction-free camping along the lake and many additional areas to explore for the adventurous folk. The days were growing shorter and the nights longer. Snow already clung to the mountain peaks and there was an arctic chill in the air. 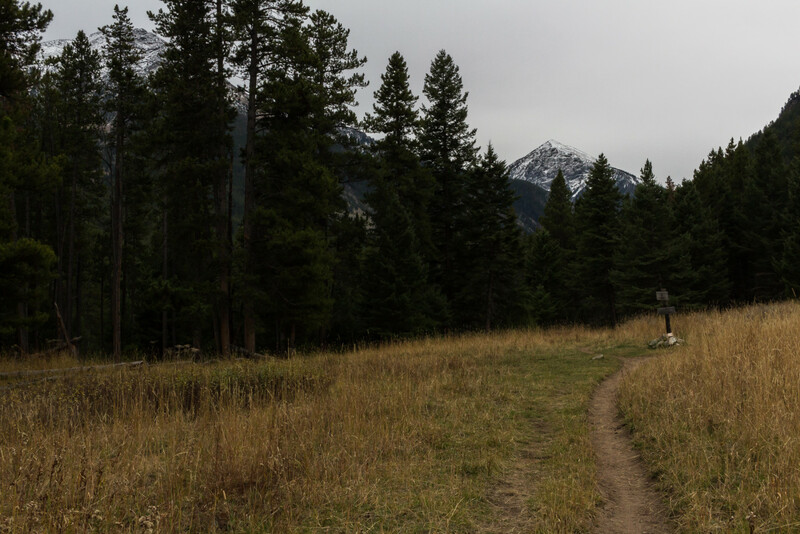 But October brings a whole new feel to things here in Big Sky Country so it was the perfect time to sneak in one last backpacking trip before winter’s fury kicked into gear. 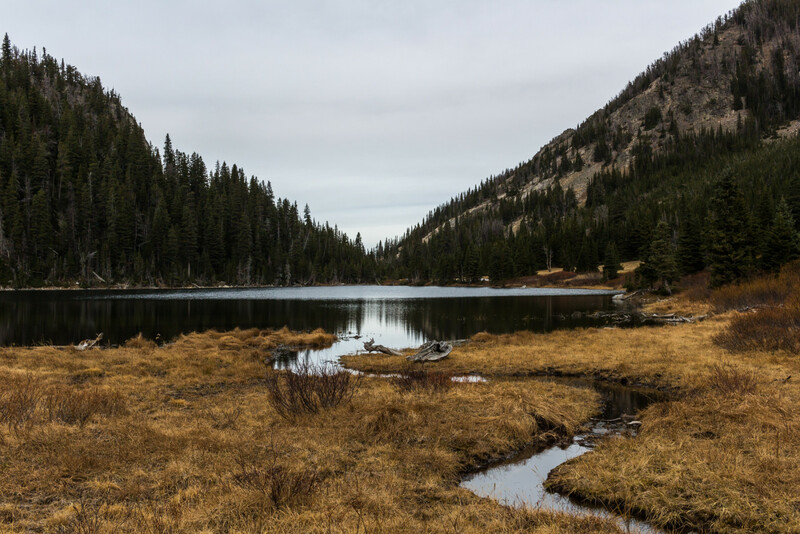 My proposition to venture to Mirror Lake, deep within the Spanish Peaks, was initially met with slight opposition. Being a high-elevation alpine lake there was no way to predict the conditions up at 8400′. Would there be snow? What would the temperature be like? Was it worth it to hike 7.5 miles into unpredictable and possibly dangerous weather conditions? But I was adamant about my proposal. The Spanish Peaks had been beckoning to me ever since I moved to Bozeman four years ago and the closest I’d been was Lava Lake. 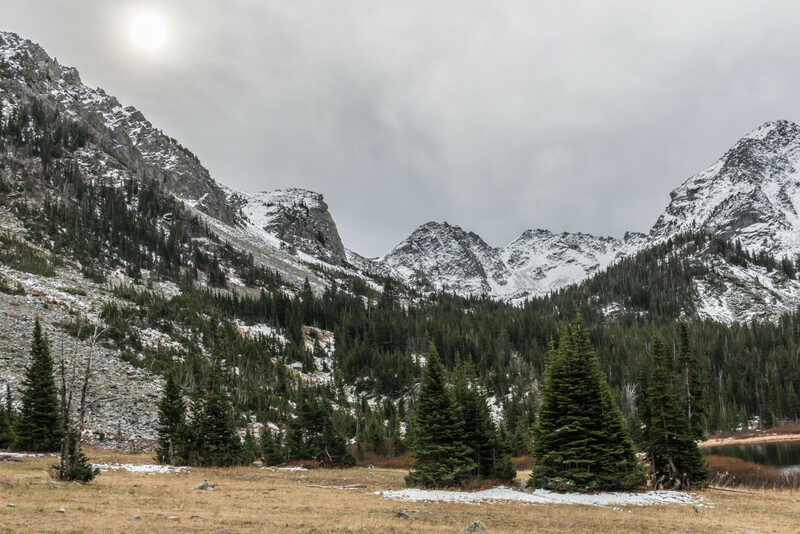 An earlier trip to Gallatin Peak had already been scrapped due to unforeseen circumstances and this was the absolute last chance to make it to the area before the end of the season. Sensing my unwillingness to give in the others agreed with my terms and our weekend destination was settled. 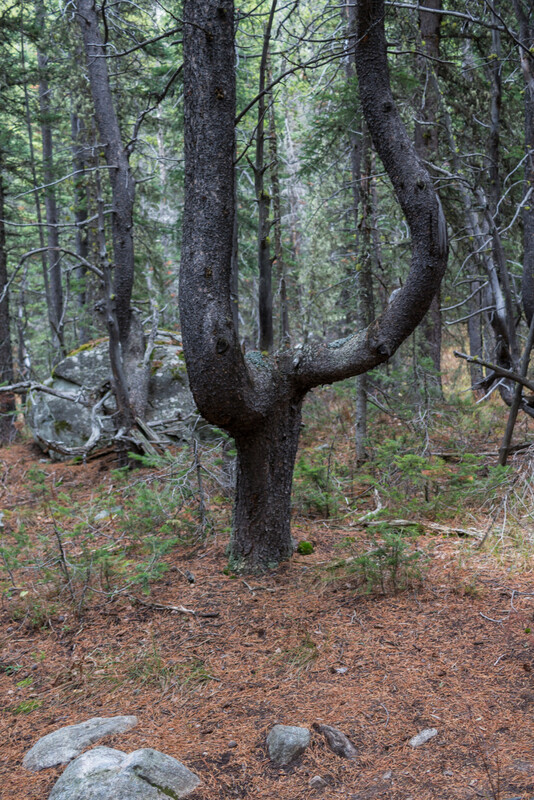 Mirror Lake can, in theory, be accessed from many angles but the shortest and most obvious choice is the Spanish Creek Trail just north of the Spanish Peaks. It follows South Fork Spanish Creek for about 4.5 miles, then continues along Diamond Creek all the way to the lake, increasing in steepness the entire way. A throng of additional lakes are accessible from this trailhead as well including Spanish Lakes and Jerome Rock Lakes. 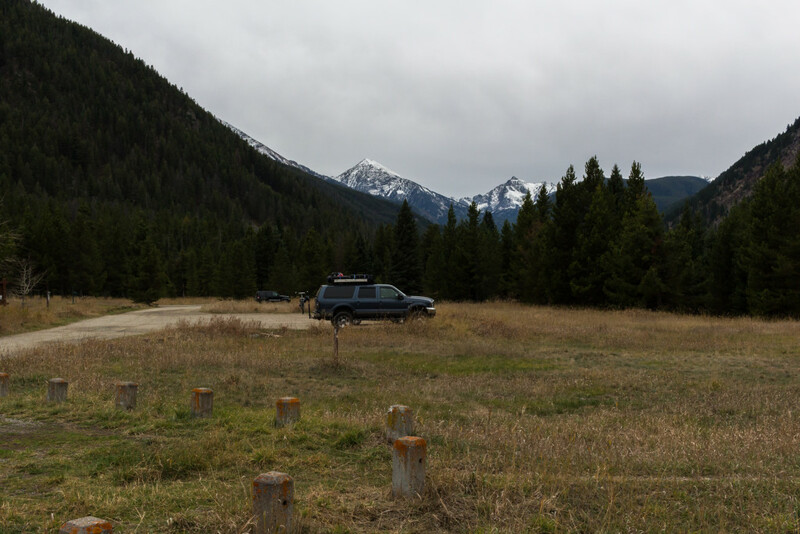 For a place as epic as the Spanish Peaks the drive is surprisingly short and simple. Spanish Creek Rd., a well-maintained 2WD dirt road, leads from the northern tip of Gallatin Canyon all the way to the trailhead. As the road turns south three massive peaks appear in the distance. Mirror Lake lies at the base of the central one, Blaze Mountain (10400′), which gives you an idea of the sort of terrain involved in the hike. 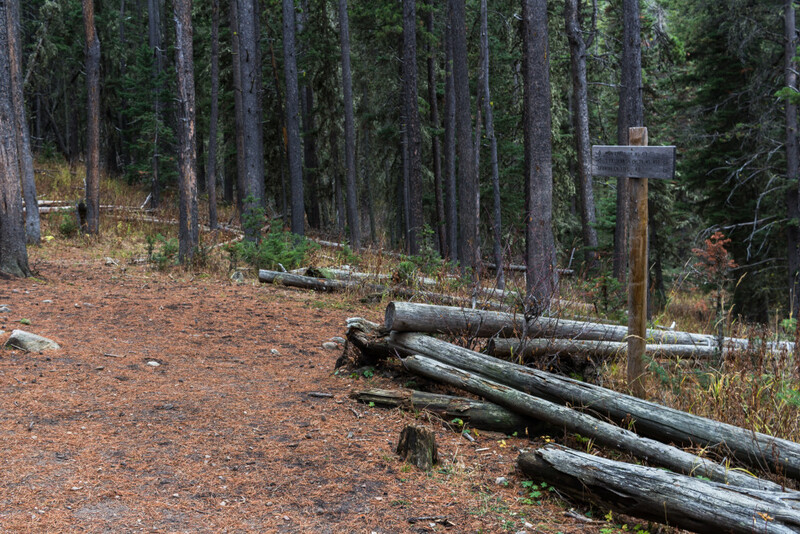 There’re two other trailheads at this access point: Cherry Creek Trail which connects with a large trail system to the west and Little Hellroaring Trail which leads east connecting with the Indian Ridge Trail. The parking situation is a bit confusing as well. There’re two lots, a “close” one and a “far” one. We parked at the “far” one which turned out to be near the Little Hellroaring Trailhead. After some searching we found our trailhead to the west of the “close” lot. There seems to be enough parking to accommodate the crowds but there were only several other cars around and no one to be seen. The view down the Spanish Creek drainage from the parking lot. Blaze Mountain in the center. 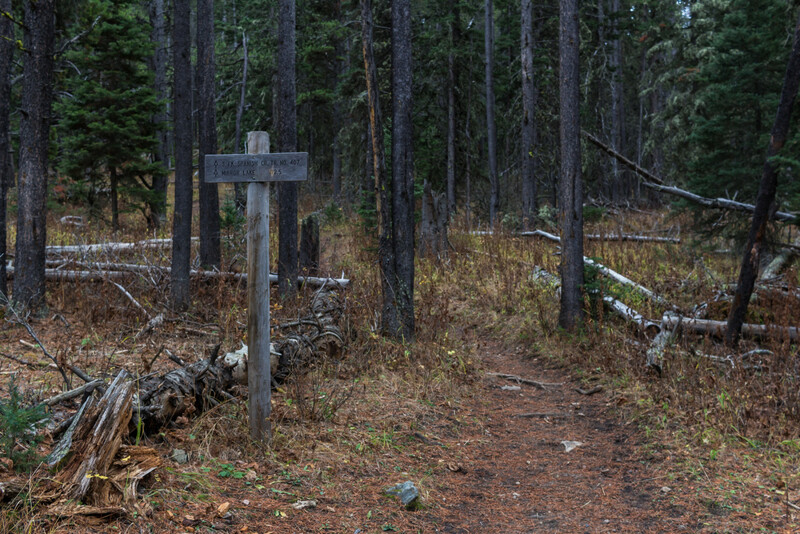 There was much terrain to cover so we hastily prepped our packs and made way for the trailhead. The trail immediately crosses Spanish Creek and turns south at the intersection with the Cherry Creek Trail which heads north. Intersection with the Cherry Creek Trail. 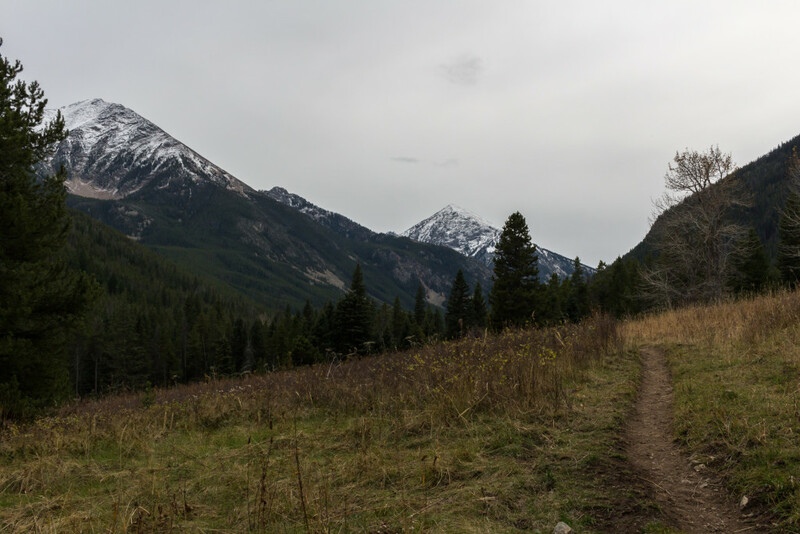 After a summer of continuous hiking my ego had skyrocketed and I felt unstoppable on the trail. As a result I had filled my pack to the brim with supplies (many unnecessary) and it felt like I was carrying a sack of bricks. I knew we were in for a long haul and I expected to fully regret this decision by the end of the trip. Most long trails have a boring section, lets face it. 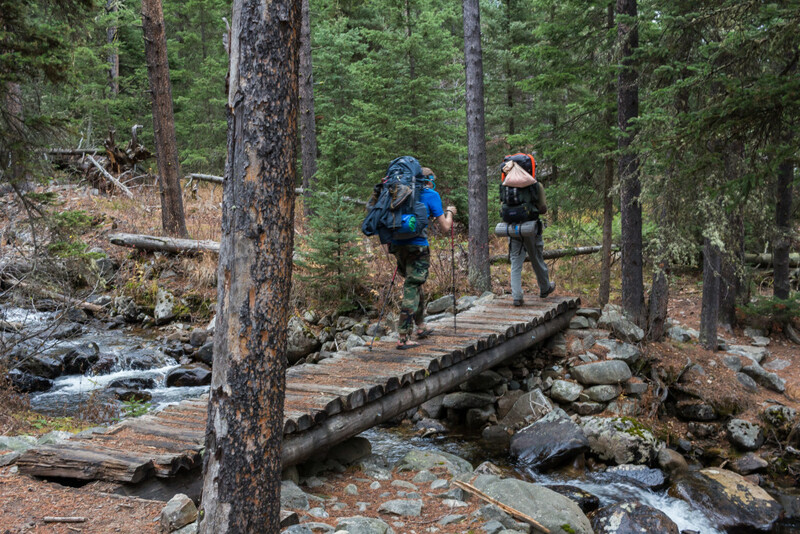 We can all agree that following a creek through a densely forested valley (essentially this trail) is not nearly as exhilarating as scrambling along a ridge 3000′ above said valley. In this case the “boring” section lasts for a dreadful 4.5 miles. At about one mile in you pass the official boundary of the Lee-Metcalf Wilderness so that’s kind of interesting. Occasionally you’ll enter a meadow and get a nice view of the three mountain peaks to the south but mostly there’s just trees. One of the few openings in the woods. Blaze Mountain on the right. At 2.5 miles the Jerome Rock Lakes Trail splits off to the right. There’s also what looked to be a fairly well-established campsite just to the left of the junction near the creek. It would make for a great beginner or early-in-the-season destination but other than that there’s little appeal. 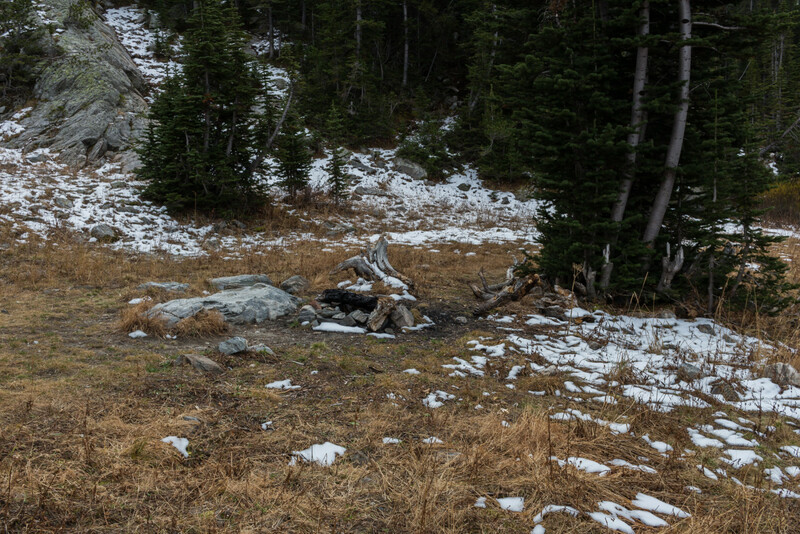 Several exhausted-looking hikers sat around the fire ring shivering perilously in the “cold”; the first sign of life since our departure (although they didn’t appear so lively). Intersection with the Jerome Rock Lakes trail. The campsite is hidden in the woods to the left. We waved and continued left at the junction. Just after the junction you cross Falls Creek which drains from the Jerome Lakes area. A massive boulder next to the creek provides some primitive seating for a quick snack break. Continuing through the valley we considered the feasibility of bushwhacking up to Diamond Lake to the east, at the foot of Beacon Point. 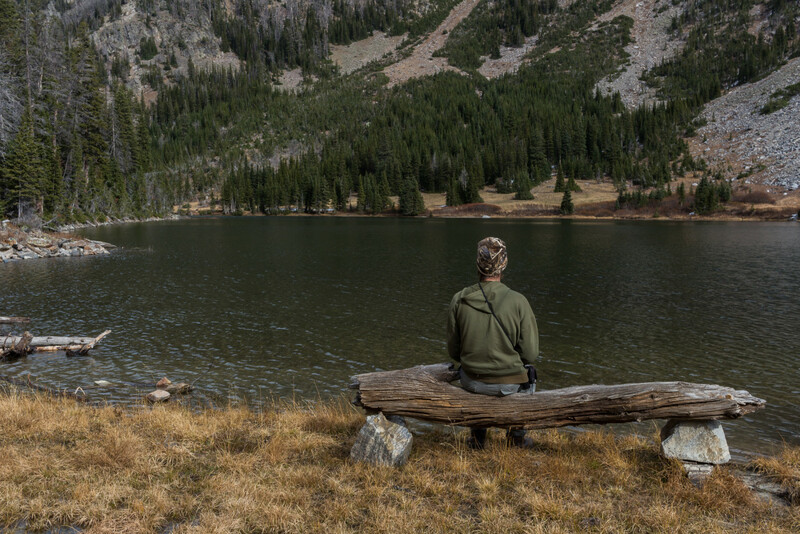 Three miles of good old-fashioned wilderness lie between us and the lake. It looked doable but there wasn’t even the slightest indication of a trail leading in that direction and I wondered if anyone had even been up there in years. These kinds of remote locations are mystifying to me and it would be such a privilege to lay eyes on something so few people have seen. The “boring” section finally ends after 4.5 miles at a 3-way-junction. 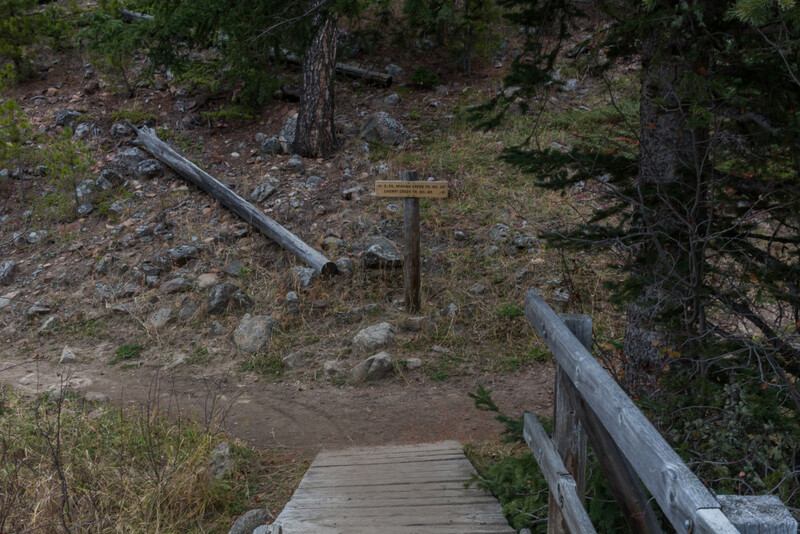 A trail leads off to the right which, after 0.2 miles, splits into the Spanish Lakes Trail and Trail 413 leading to the Jerome Rock Lakes area. To the left the trail follows Diamond Creek which drains from Mirror Lake, about 2 miles ahead. Finally things got a bit more interesting albeit more exhausting. The steepness increases quickly and there’s a mother-load of switchbacks to climb. About halfway up there’s a neat overlook with views of the Spanish Creek drainage. You get a nice view of the secondary drainage’s as well, which gives an idea as to the location of the other lakes in the area. They’re certainly worth investigating in the future. After a bit more climbing the trail levels and emerges from the trees on the northern end of Mirror Lake. 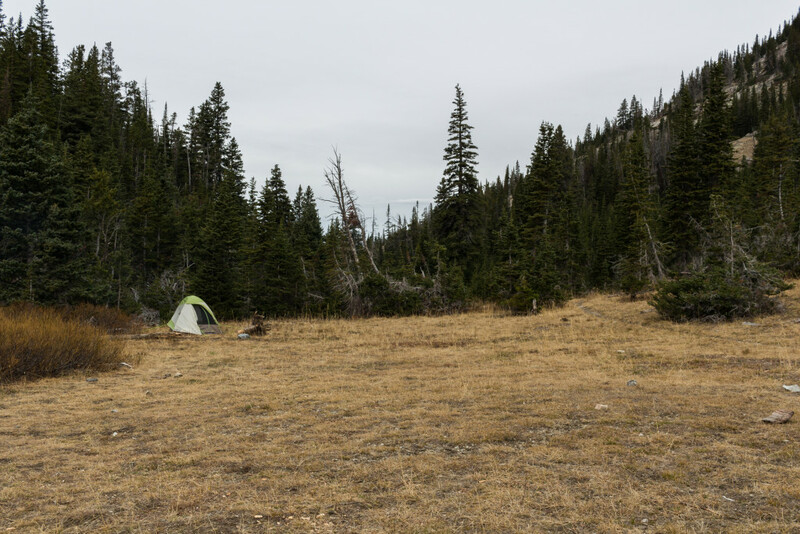 Aside from the mountain peaks the area was nearly free of snow which allowed us to camp anywhere. 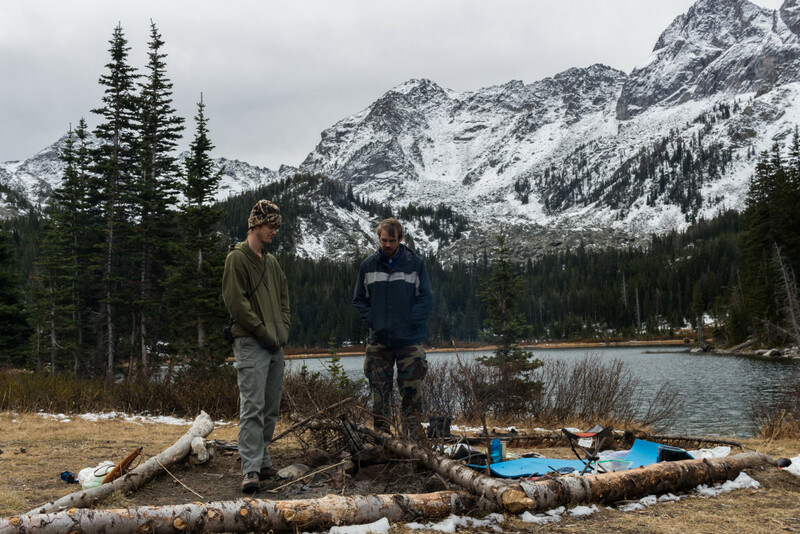 Conveniently there’s a very well-established campsite right at the northern tip of the lake. 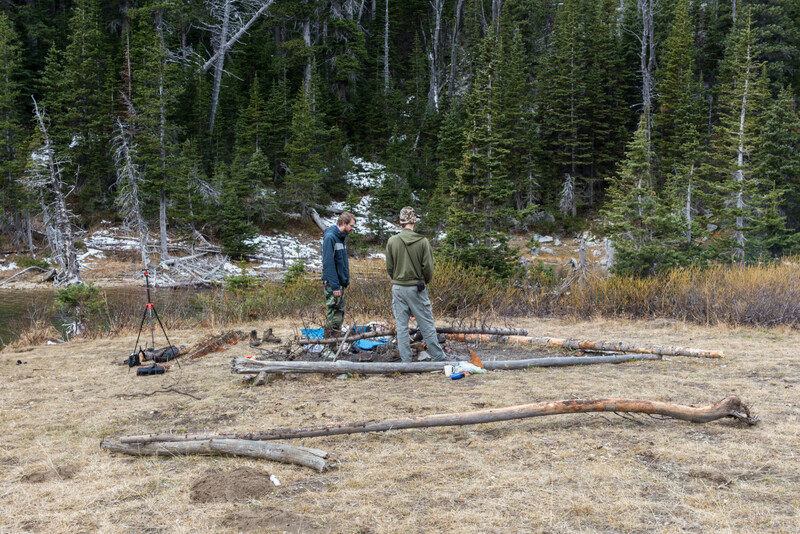 It was a relief to be able to just throw down our packs and begin setting up camp right away; sometimes finding a site is an adventure of its own. 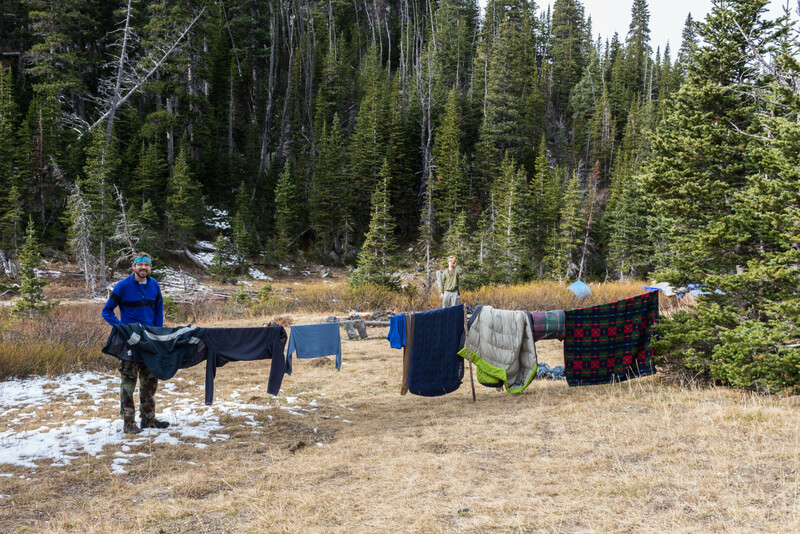 There’s plenty of spots to pitch a tent in the area. The land slopes slightly upward towards a ridge to the east but there’s some flat spots hidden in the trees. Wood was a little hard to come by as well but with enough scavenging we were able to gather enough to get a nice fire going which would burn long into the night. Mirror Lake as seen from the campsite. Many “almost” flat areas to pitch a tent. Christian roasting a a dog. It was a magical night sitting around the campfire feasting and enjoying good company. A defiant wind howled across the lake and a light dusting of snow fell daintily overhead. The ghastly glow of the full moon illuminated the entire basin and clouds raced across the sky, further adding to the mystique. Winter was definitely upon us and as we settled in to our tents I wondered if we’d be battling the cold throughout the long night. 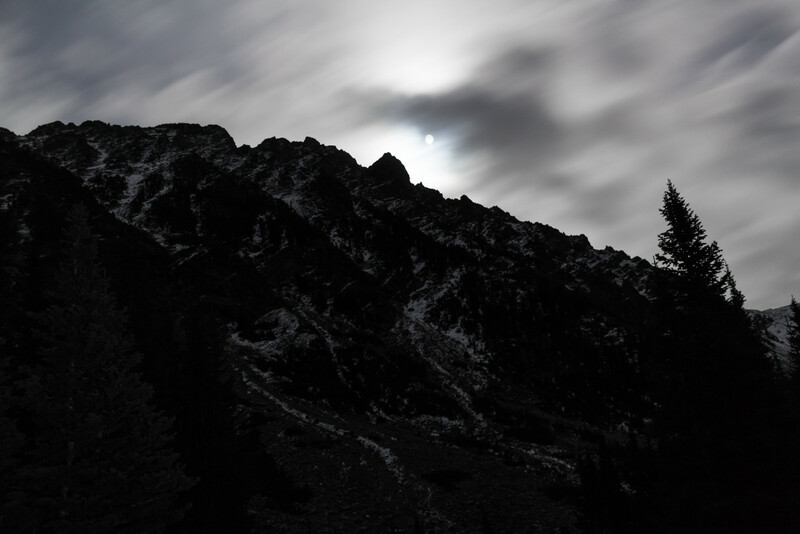 It was incredible to witness the full moon rise above the ridge. The night wasn’t nearly as cold as I expected and I awoke just as it was becoming light out feeling totally refreshed. Eager for an early-morning view of the lake I grabbed my camera and took off south along the trail before anyone else was up. After a short distance I left the trail and headed up a scree slope to the east seeking a panorama of the lake. I scrambled around the scree searching for the perfect angle and was able to eventually capture the full extent of the basin. It was nice to have some alone time to photograph the scene in peace and after some reflection I headed back to camp to greet the others. Full panorama of the basin. Blaze Mountain is adjacent to Mirror although I believe that’s a false summit. We had a quick breakfast and set out south along the trail for a quick tour of the lake. About a quarter mile down the trail we stumbled on another campsite. It’s a dainty little site but not nearly as roomy and open as ours. We continuing around the southern end of the lake hopping across a maze of minor streams entering Mirror Lake. Summit Lake, about 2 miles further up the trail, is the source of these streams and would be another great destination. 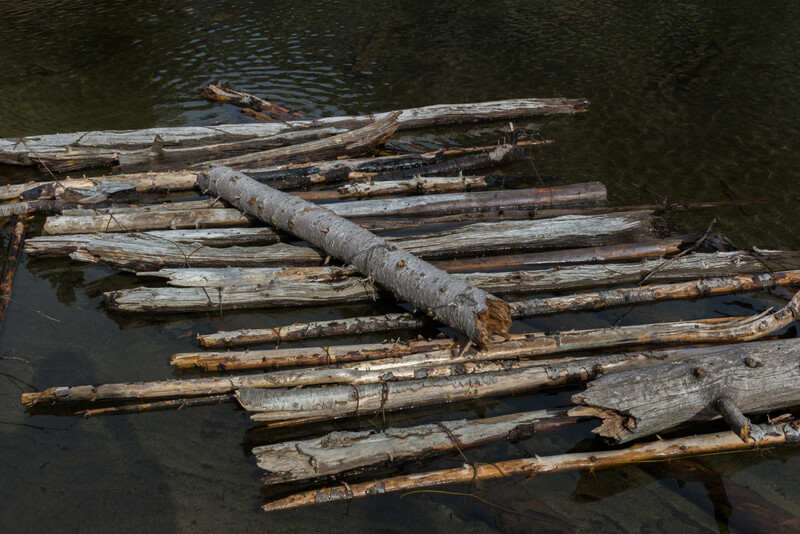 A log jam provides a way back across the creek if you wish to circle around the lake. Keeping warm around the fire. The other, less desirable campsite. A small group of ice climbers that we ran into had occupied it the previous night. Christian gazing over the lake. Looking south from the campsite. 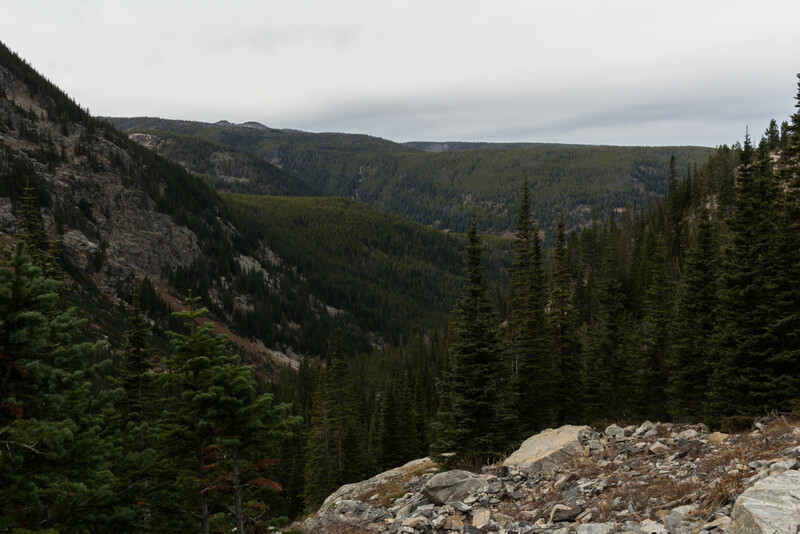 The trail continues through the mountain pass to the left towards Summit Lake. Despite having devoured all my food my pack was still beastly heavy and the return dragged on forever, especially the 4.5 mile boring section through the trees. By the time we made it back to the car I was completely exhausted and my shoulders ached pretty bad from the weight. As we packed up the car I vowed never to pack my backpack so heavy again, at least not on a 7+ miler, it just wasn’t worth the pain. Visiting the Spanish Peaks area had opened up a whole new world of adventures and I now regret not visiting the area sooner. Unfortunately we’d have to wait through a long cold winter to attempt any of those adventures but when the time comes we’ll be more than ready. Crossing Falls Creek on the way back. Walk away quietly in any direction and taste the freedom of the mountaineer. Camp out among the grass and gentians of glacial meadows, in craggy garden nooks full of Nature’s darlings. Climb the mountains and get their good tidings. Nature’s peace will flow into you as sunshine flows into trees. The winds will blow their own freshness into you, and the storms their energy, while cares will drop off like autumn leaves.